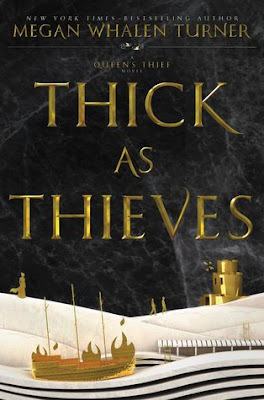 I'm sure by now you've heard the amazing news that we have not only a release date, but a title and cover as well for the incomparable Megan Whalen Turner's fifth Queen's Thief book—Thick as Thieves. It's due out in hardcover May 16th of next year. So definitely what feels like a ways off yet, but it's been six years, people. This is huge progress from where we fans have been. And, if you trot on over to the description on Goodreads, you'll note that our new POV character is none other than Kamet (! ), which thing filleth me with joy. 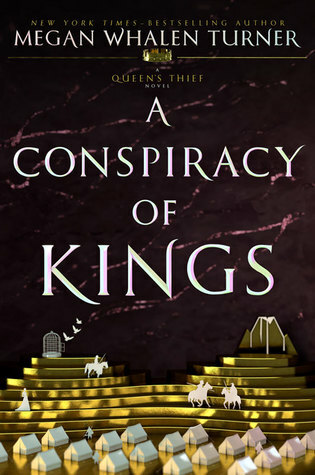 I can say that having worked through my initial emotions at coming to The King of Attolia and finding out the narrator was some unknown by the name of Costis and, of course, subsequently recognizing the error of my ways. Costis, I love you! Kamet, I am one hundred percent ready for your adventure! So. As for my feelings. 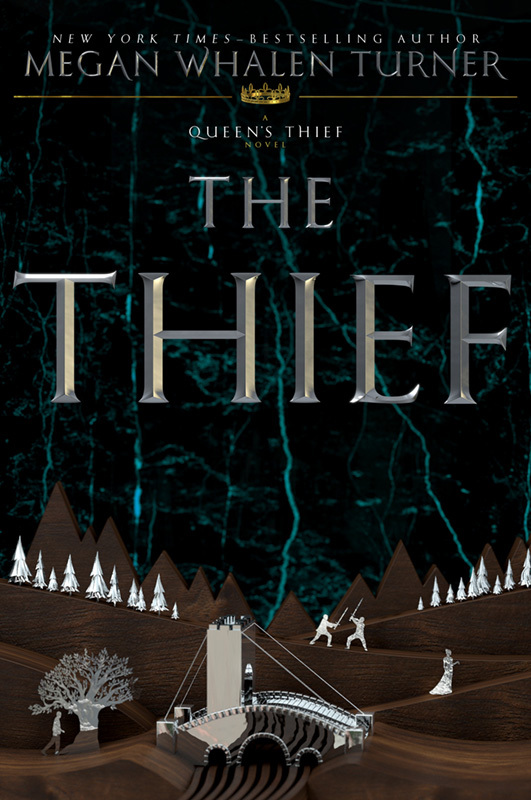 We're back to a version of the word thief in the title, and I really love that. And they've finally branded the series officially as the "Queen's Thief" series, which has always been the perfect title and is therefore very gratifying. There will also be, yes, a map! More than one, I believe. As well as extras, including short stories and cast lists. For more, check out the Publisher's Weekly interview with Ms. Turner about the new book here. As you can see, they've also given the entire series cover redesigns (in paperback, of course) to be released February 28th. And here's where my emotions get a bit sticky. And it's no fault of the publisher's. Longtime readers (and confirmed book collectors) will persist in getting attached to certain covers and cover artists, won't we? We will always want our sets to match. Or at least have matching be within the realm of possibility when our bank accounts allow such indulgences. To be fair, this move is standard operating procedure in publishing. There's been a gap of a number of years between books, enough that the old covers probably don't feel as fresh as they once did. Enough that it would be excellent to reach a wider, newer audience with updated, possibly more broadly appealing covers. And, hey, it would be superb to potentially reach a somewhat older young adult audience as well, particularly given the sophistication and beautiful complexity that characterizes this astounding series. I get it. I really do. It's just also true that my heart broke a little that we wouldn't be getting the final two books wrapped up in Vince Natale's perfect, perfect covers. And that this was such a radical shift from those. I'm still getting used to them, of course. 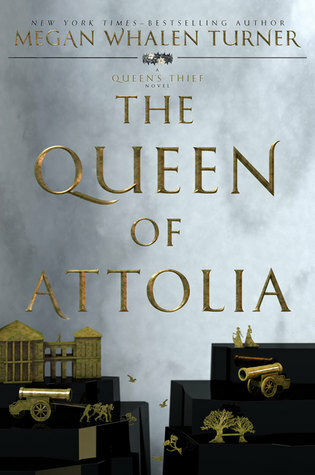 So far, the cover for the new one is my favorite. 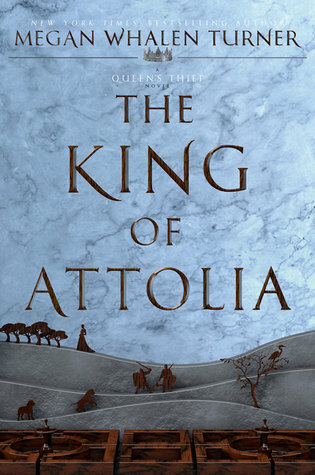 But it's my misfortune to believe that the Vince Natale cover of The King of Attolia is quite possibly the best book cover to have ever graced a book in the history of books. I mean, the original covers of The Scorpio Races and Sunshine are right up there with it. Do not get me wrong. But that cover? With that Gen who is so precisely my Gen? With Attolia's hand? The rings, the sword, the cloak? Well, as I said. Too attached for my own good. For the record, Aaron took one look at the new covers and loved them. Our personal experiences with novels certainly inform our cover emotions/desires/hopes/fears. Ahem. All of this said, I require your thoughts on the matter. Please share (and celebrate) with me.